When you land at Hyères, you’re already on holiday. 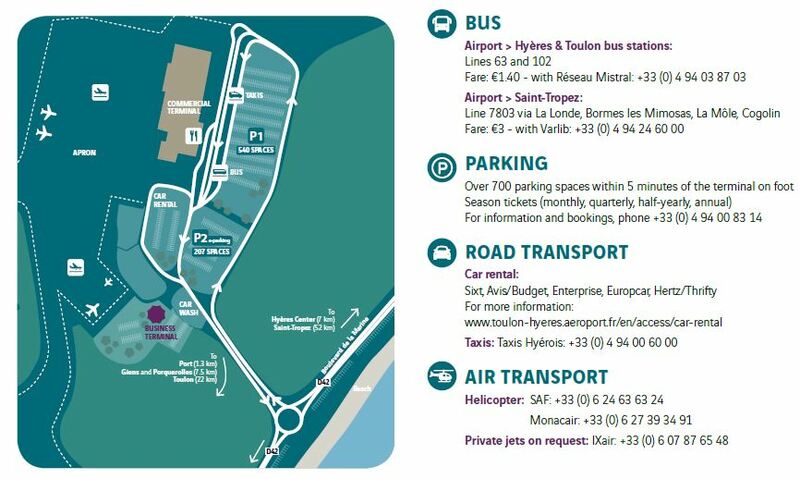 Located opposite the beaches of Hyères, halfway between Provence and the French Riviera, Toulon Hyères Airport is ideally placed at the heart of the Var, the most popular tourist region in France after Paris. beautiful beach in Europe in 2015. Just 20 kilometers away along the A57 motorway lies the city of Toulon, housing the most beautiful harbor in Europe, a lovely old town and a port which is the launching point for ferries to Corsica and cruise liners. A host of iconic landmarks of worldwide renown are located less than 50 kilometers from the airport, including the celebrated town of Saint-Tropez and the legendary Paul Ricard race track in Le Castellet, which is once again hosting the French Formula 1 Grand Prix! Appointed by the French government, VINCI Airports took over management of the airport on April 1, 2015, for a period of 25 years. With around half a million passengers in 2017, it is one of the main regional airports in France. Toulon Hyères Airport is one of three French airports used for both civilian and military purposes. The French Navy play a key role in the life of the platform. For over 50 years it has benefited from the know-how and rigor of this military corps, an additional asset in terms of air traffic control and security.